The Fontan procedure is the conventional terminal palliative procedure in children with single ventricle physiology. Surgical fenestration of the Fontan decreases immediate postoperative morbidity, despite no proven long-term benefits. A primary indication for fenestration closure is to reduce the future risk of paradoxical emboli. Fenestration closure, however, may increase the risk of plastic bronchitis, protein-losing enteropathy, and liver cirrhosis. Surgical versus transcatheter fenestration creation, or dilation of an existing fenestration can improve symptoms that are refractory to medical therapy. Transcatheter creation of a fenestration can be technically challenging in cases with complex venous anatomy. We report a case of a 5-year-old boy with single ventricle physiology and complex venous anatomy who developed plastic bronchitis shortly after device closure of the Fontan fenestration. A fenestration was successfully recreated along with stent implantation across the Fontan baffle via transjugular approach. A 5-year-old male with a history of complex congenital heart disease that included heterotaxy, dextrocardia with atrial and visceral situs inversus, unbalanced atrioventricular canal (AVC) with mildly hypoplastic left ventricle, ventriculoarterial concordance with aortic atresia and arch hypoplasia, left-sided superior vena cava (SVC), and interrupted left-sided IVC with azygos continuation [Figure 1] presented to our institution with hypoxia, persistent cough, and respiratory distress. His prior palliative procedures included Norwood/Sano procedure as an infant followed by a Kawashima repair at 6 months of age, with subsequent lateral tunnel fenestrated Fontan completion using Gore-Tex material at 2.5 years of age. Chylous effusions complicated his postoperative course and he subsequently had a right pulmonary artery stent placed. At 4.5 years of age, he underwent cardiac catheterization and fenestration closure with a 4-mm Amplatzer septal occluder (ASO) (St. Jude Medical, St Paul, MN) and occlusion of an aortopulmonary collateral using an Amplatzer vascular plug II. Shortly after the fenestration closure, the patient began having respiratory symptoms consistent with plastic bronchitis but the family had relocated and had no cardiology follow-up for several months. Six months after the closure, he presented to our institution with plastic bronchitis, on medical therapy including steroids, beta-agonists, and chest physiotherapy. In the interim, the patient had been hospitalized twice with hypoxia, respiratory distress, persistent cough, and intermittent facial edema. Chest X-ray showed prominent perihilar markings, bilateral small pleural effusions, and mild pulmonary edema. His initial echocardiogram at the time of presentation demonstrated mildly diminished ventricular function with an ejection fraction (EF) of 53%, mild AV valve regurgitation, and a widely patent lateral caval Fontan connection and superior cavopulmonary connection. The ASO device appeared to be in good position with no residual shunting. The device had been in place for too long to consider device retrieval. 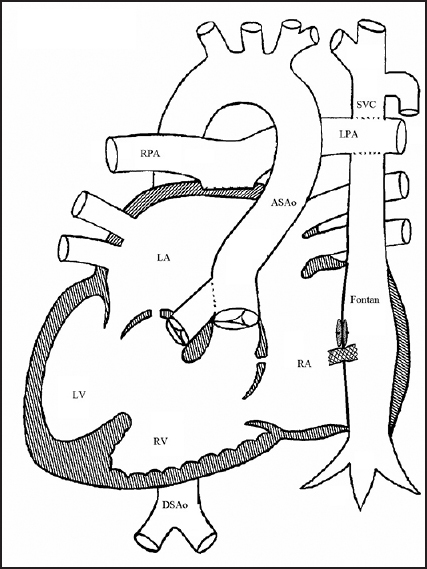 Therefore, he was referred for cardiac catheterization to create a Fontan fenestration. Cardiac catheterization was performed under general anesthesia. The interrupted IVC with azygos continuation left transhepatic and transjugular access as two primary considerations for vascular access. Transhepatic approach was eliminated in this case because of a right dominant hepatic venous system leaving transjugular approach as the only available approach. Baseline mean Fontan pressure and transpulmonary gradient were 17 mmHg and 10 mmHg, respectively. The transpulmonary gradient was measured using mean Fontan pressure and pulmonary capillary wedge pressure (17-7 = 10 mmHg). Pulmonary vascular resistance was elevated at 4.86 Wood units*m 2. Systemic oxygen saturation was 79%. Hemodynamic measurements and Fontan angiography demonstrated stable fenestration device position without any residual shunting [Figure 2]. No additional baffle leaks or venovenous collaterals were noted. The previously placed Amplatzer device served as the chosen landmark. Using transesophageal echocardiography (TEE) and fluoroscopic guidance, we identified the location just inferior to the device. 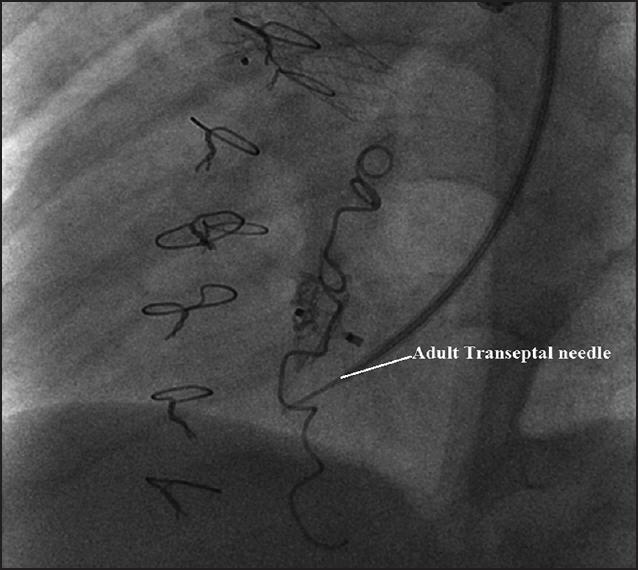 This location was chosen based on the available atrial space identified by TEE relative to the position of the device. Fontan baffle puncture was successful using a pediatric transseptal needle, but we could not advance the 7F transseptal sheath across it. The sheath then was exchanged with an adult transseptal sheath and an 18-gauge adult transseptal needle (Cook Medical, Bloomington, IN) was used to cross the baffle [Figure 3]. The transseptal needle was minimally modified by slightly increasing the curvature of the distal end of the needle to account for the angle of approach from the left internal jugular vein. Care was taken to not increase the needle curvature to the extent of losing the ability to apply sufficient force against the baffle. The selected baffle site allowed us to apply sufficient force to cross the baffle with sufficient space to not injure the posterior wall of the right atrium once crossed. The dilator crossed, but the sheath would not cross the newly created fenestration. Therefore, the fenestration was further dilated using a Sterling 4 mm × 2 cm balloon (Boston Scientific, Marlborough, MA) followed by Dorado 7 mm × 4 cm balloon (BARD Peripheral Vascular Inc., Tempe, AZ). A Palmaz Genesis Blue 19 mm × 9 mm premounted stent was subsequently advanced across the Fontan baffle. 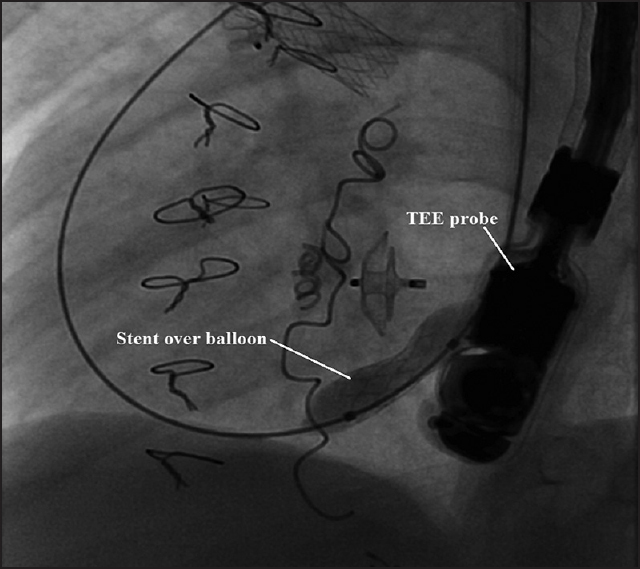 Under TEE and fluoroscopic guidance, the stent was successfully deployed across the baffle. A residual waist was left intentionally in the stent, leaving a “dumbbell” shape to prevent stent dislodgement [Figure 4]. Postprocedure TEE and angiography confirmed stable stent position with right to left shunting across the stent [Figure 5]. The poststent mean Fontan pressure and transpulmonary gradient were 18 mmHg and 11 mmHg, respectively. There was no immediate improvement in the transpulmonary gradient and oxygen saturation. The patient had recovered well from the procedure and was discharged the next day. At 6-month follow-up, the severity and frequency of his pulmonary symptoms had improved without additional medical therapy. His oxygen saturation was 83% on room air. Follow-up echocardiography showed stable stent position with right to left shunting and a mean gradient of 5 mmHg. A follow-up catheterization performed 2 years later demonstrated a baseline saturation of 83%. The following hemodynamic data are included: A mean Fontan pressure of 7-8 mmHg, transpulmonary gradient of 5-6 mmHg, ventricular end diastolic pressure of 2 mmHg, and normal pulmonary vascular resistance of 1.99 Wood units*m 2. Goff et al. demonstrated that Fontan fenestration closure in suitable patients did not increase the risk of death in the first 5-10 years. Few patients had the following features of decompensation: Developing protein losing enteropathy, plastic bronchitis, and ascites. Their criteria not to close the fenestration was in the setting of a decrease in cardiac output or a rise in Fontan pressure >20 mmHg with fenestration test occlusion. Despite favorable hemodynamics at baseline and with test occlusion, this patient developed symptoms of plastic bronchitis within weeks of fenestration closure. 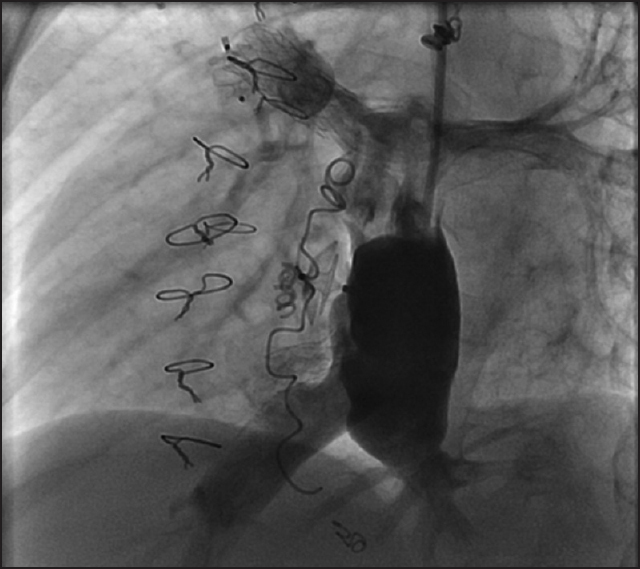 Plastic bronchitis is a rare and potentially life-threatening complication after the Fontan operation in which bronchial casts are formed in the bronchi and bronchioles leading to severe and recurring airway obstruction. The contributing factors are increased pulmonary venous pressure, increased central venous pressure, and endobronchial lymphatic leakage. Standard medical therapies include steroids, bronchodilators, pulmonary toilet, acetylcysteine, and bronchoscopic removal of casts. Fenestration creation or enlargement is another therapeutic option in the refractory cases., Our patient had frequent exacerbations of plastic bronchitis despite the aggressive medical therapy. Systemic venous pressure was elevated with a mean pressure of 17 mmHg. Upon creation of a fenestration, no immediate improvement in transpulmonary gradient and oxygen saturation were noted likely due to underlying chronic pathological changes in the lung secondary to plastic bronchitis. Given the known disease, we deemed it reasonable to provide time for clinical changes to occur as a result of the intervention instead of more aggressive dilation of the fenestration that could manifest undesirable results in the ensuing months. At 6-month follow-up, the severity of his pulmonary symptoms and frequency of exacerbations improved significantly without any changes in medical therapy. There have been no additional casts present with coughing. His oxygen saturation was improved to 83% on room air. His subsequent cardiac catheterization showed favorable hemodynamics for Fontan physiology with low ventricular end diastolic pressure (2 mmHg), low Fontan pressures (7-8 mmHg), and a transpulmonary gradient of 5-6 mmHg. Kreutzer et al. reported transcatheter baffle fenestration creation and/or dilation in 14 symptomatic Fontan patients. Transcatheter fenestration creation becomes more challenging in patients with complex venous anatomy. Kobayashi et al. reported successful extracardiac Fontan fenestration creation and stent implantation through transhepatic approach in a 4-year-old girl with dextrocardia, interrupted IVC with azygos continuation to a right SVC. Our patient had complex venous anatomy with left-sided interrupted IVC with azygos continuation to a left SVC, precluding femoral access. A transhepatic approach was eliminated in our case due to a dominant right hepatic venous system, leaving transjugular approach the best option for access. With minimal modification of equipment and carefully selecting a location to allow adequate force to be applied while providing adequate space in the adjoining atrium, and the fenestration was successfully created. Nevertheless, this approach is more difficult as the transseptal needle enters parallel to the target, and while the curve of the needle is necessary to engage the baffle wall, it also diminishes the effective force needed to cross the material. TEE guidance aided this effort by affording visibility of surrounding structures to identify the optimal location to apply the required force. 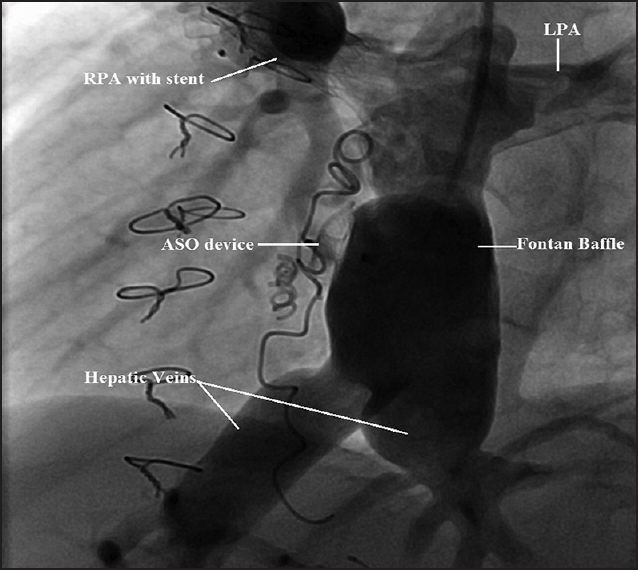 This report highlights successful stent fenestration creation of a lateral caval Fontan in a patient with complex venous anatomy suffering from plastic bronchitis after prior device closure of the surgical fenestration. With minor modifications to the equipment, Fontan fenestration was possible despite an uncommon and complex anatomic substrate. Atz AM, Travison TG, McCrindle BW, Mahony L, Quartermain M, Williams RV, et al. ; Pediatric Heart Network Investigator. Late status of Fontan patients with persistent surgical fenestration. J Am Coll Cardiol 2011;57:2437-43. Rychik J, Rome JJ, Jacobs ML. Late surgical fenestration for complications after the Fontan operation. Circulation 1997;96:33-6. Goldberg DJ, Dodds K, Rychik J. Rare problems associated with the Fontan circulation. Cardiol Young 2010;20(Suppl 3):113-9. Goff DA, Blume ED, Gauvreau K, Mayer JE, Lock JE, Jenkins KJ. Clinical outcome of fenestrated Fontan patients after closure: The first 10 years. Circulation 2000;102:2094-9. Chaudhari M, Stumper O. Plastic bronchitis after Fontan operation: Treatment with stent fenestration of the Fontan circuit. Heart 2004;90:801. Wilson J, Russell J, Williams W, Benson L. Fenestration of the Fontan circuit as treatment for plastic bronchitis. Pediatr Cardiol 2005;26:717-9. Kreutzer J, Lock JE, Jonas RA, Keane JF. Transcatheter fenestration dilation and/or creation in postoperative Fontan patients. Am J Cardiol 1997;79:228-32.